Welcome to Thompson River Pediatrics and Urgent Care. We provide a full range of pediatric services including well child care from birth to age 18 and sick care for all pediatric illnesses. We offer same day sick appointments, as well as walk-in urgent care hours daily. We want to be able to see your child when you need them seen by a professional. When your loved one falls ill or needs a routine assessment, the last thing you want to worry about is whether your child will find immediate relief. Fortunately, the medical professionals at Thompson River Pediatrics in Johnstown, CO, understand the importance of swift aid and punctual appointments. You'll find reliable and punctual professionals at Thompson River Pediatrics, whether your child needs a sports physical for school or you want to ensure your newborn gets comprehensive medical services from the start. At Thompson River Pediatrics in Johnstown, CO, we know that when your child gets sick, you don't want to wait. That's why we offer urgent care hours within our regular hours of operation. Thompson River Pediatrics accepts walk-in appointments with urgent care needs. As a full service pediatric clinic caring for children from birth to age 18, we can care for a variety of pediatric illnesses, through comprehensive medical services. We work hard to ensure you have quality care in a timely manner so your child can spend more time healing and less time waiting to be seen. Thompson River Pediatrics is committed to the care of all children. We accept most major insurances including Colorado Medicaid and CHP+. If we don't currently take your insurance, we will work on getting approved to do so, if it's possible. Owned and operated by mothers, we understand parents' desire for personal, comprehensive and timely care for children. We want parents and children to leave each visit with all questions answered and your child's need addressed. Dr. Franques is the most amazing pediatrician! She has taken care of my three girls for the last 5 years! There is no one I trust more with my girls health-care needs than Dr. Franques. I was nervous at first when I learned that my Pediatrician's office was getting a new doctor, but Dr. Franques won us over with her warm, caring personality and has been caring for my children ever since. During the past five years our whole family has gotten to know her very well. She is much more than a skilled and professional pediatric doctor for my children; we think of her as extended family. Her honest, open and caring nature always put me and my girls at ease, no matter what the situation. Anytime my children were ill, the follow up and concern she demonstrated was very reassuring and appreciated. All my girls adore her, which makes it easier for them to deal with any medical issues, but they ask to visit her even if they are healthy. We highly recommend Dr. Franques! Dr. Franques is truly amazing! She has taken wonderful care of my children over the past 4 years! She is completely devoted to making sure her patients get the best of care! My children were never afraid to go to the doctor because she has always made it a positive experience for them! Thank you for your dedication, kindness and compassion! You certainly make a difference in children's lives! 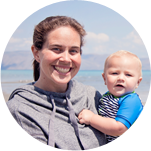 We recently took our 6-month old baby to Thompson River Pediatrics and Urgent Care for an infection in his eye. We chose this office because of their convenient urgent care hours and easy location. We were kindly greeted at the desk and taken to an exam room in just a few minutes. We met Dr. Franques at this visit; upon her entry into the exam room, my baby gave her a giant smile, which he does not usually do with strangers! I was impressed with her thorough exam even though she could immediately tell his eye was the reason for our visit. She also took the time to ask about any other concerns or questions I may have regarding my son. I felt confident in her diagnosis and we were out of the office with treatment in 30 min! The convenient urgent care hours of Thompson River Pediatrics, helped a full time working mother get care quickly, and continue on with my busy day. The overall experience we encountered with this office makes this Loveland native confident in making Dr. Franques our children's new primary pediatrician. Thanks Thompson River Pediatrics for making our visit GREAT! What a wonderful office to take your kids too! Dr. Franques and her entire staff are kind, considerate and professional! Always a great experience! Wouldn't trust anyone else with my kids! As a mama of 7, I'm am very impressed with the team as Thompson River Peds. I had all my children scheduled for annual exams and not so fun shots! We were seen right away and my children felt comfortable as they were being asked questions and thoroughly examined. . Lots of smiles from the staff and Doc. We will be referring families daily. I appreciate being treated with respect as a whole family. Thanks ladies!! You're AWESOME!! Absolutely love this pediatric office. Dr. Franques is incredibly knowledgeable with great patient rapport. We had spent two years battling breathing problems and frequent bouts of croup/bronchitis. On our first visit to Dr. Franques, she diagnosed our son with asthma. Her treatment plan has made a dramatic improvement in his quality of life. We have never had a problem getting in for an appointment, and the office environment in very clean and inviting. Also, we very rarely encounter any other patients in the waiting area, a bonus during cold and flu season. We can't say enough positive things. Absolutely love Dr. Franques. She is amazing with my kids. We have had some bad experiences with other doctors offices. They are by far the best. Always can fit my kids in when needed and as a full time working mother i appreciate it. My baby just had her first appointment here, and I was very impressed! The nurses, student doctor, and pediatrician were all very nice and respectful. They answered all of my questions without any judgement and without pushing any opinions on me. They also did a great job of giving my baby her vaccinations as quickly and painlessly as possible. We recently moved to the area and have been looking for a new pediatrician for our son. He fell ill this week and I was pleasantly surprised that they had urgent care hours available. I was able to be there a few minutes after they opened, and I was able to get him in quickly. The office was very pleasant, especially for children! I loved that the floors were wooden laminate, and not carpet, especially for allergies and cleanliness factors. The patient's room we were in was sizable, with enough room to move around. Even a fun wall activity where it used the heat of their hands to make art. The nurse and doctor were both very professional and knowledgeable. Great experience and will be back! I was able to get a same day appointment to have my son seen today. This was our first visit to the office and we saw Nicole, the nurse practitioner on staff. She was excellent, kind, and attentive. The supportive staff was just as great. I have heard fantastic things about this office, and they do live up to their reputation. Glad to have found you so close to home. Thank you again for taking care of my not so little boy today! Took my 4 month old here for a check-up. I was extremly scared because of past experiences at a different dr. that ended in tears and pure outrage. The moment I walked in all nervousness went away. Everyone was on top of it, extremly professional, I felt like the pediatrician took her time along with the nurses. Most importantly I felt heard and I honestly feel like my daughter is in good hands. Couldn't ask for a better doctor visit. Thompson River Pediatrics was absolutly perfect.